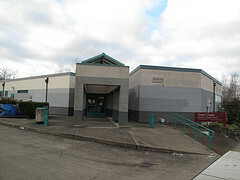 As of January 31, 2011, Tacoma Public Library System will have eight locations instead of its current ten. Both Swan Creek Branch and M.L. King, Jr. Branch will be closed. 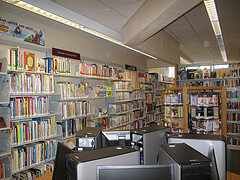 The main branch will also have its hours reduced from 66 to 54. 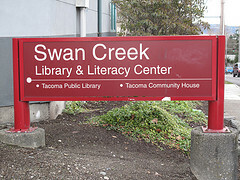 Swam Creek is the smallest of the libraries and shares its space with Tacoma Community House, which runs a literacy center for the local population. Per the library’s website, Tacoma Community Center has significant experience working closely with persons with little or no English language and comprehension skills, or without significant education experiences. 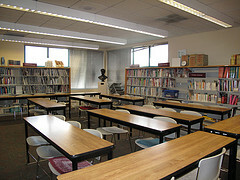 Classes include English as a Second Language and computer skills. The library has an expanded foreign language materials selection and bilingual assistance is available in Russian and Cambodian, as well as Spanish and Vietnamese upon request. The door count (patrons entering the building) was over 4,000 in November, the last full month available. Many of the patrons walk to the branch and will soon need to take one or more buses to reach the next closest branch. It is true that Swan Creek had the lowest circulation statistics, which makes sense since they also had the smallest collection size. Library materials and equipment from this branch will be redistributed to other branches, but the fate of the building and the Tacoma Community Center lease remains unknown. Although the building was built in 1989, there is deferred maintenance. This entry was posted in Art -- there is art here!, Books (Libraries and Bookstores), Government, Tacoma, Their future is in question, WA State - Pierce County and tagged Asimov, branch, branches, Cambodian, closing, collection, deferred maintenance, english as a second language, patrons, reduction, Russian, Swan Creek, Tacoma Community Center, Tacoma Public Library on December 22, 2010 by admin. So sad. On this MKL jr. day we see signs going up on the MLK branch announcing the closure. It is sad. I took a couple of photos of MLK Library today. I feel so bad for the poor kids that regularly use that library.